An extensive range of hand made and hand printed 100% cotton Children's T-shirts featuring the beautiful wildlife designs of Alison Green. Alison meticulously screenprints her designs on a variety of textile products. Visit her website and choose from over 30 designs in the Adult T-shirt range and 14+ Children's designs with 4 sizes available in each range. 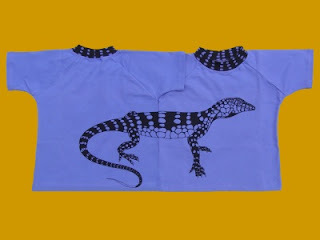 All Adult's T-shirts (and some Children's) feature a different yet related design on the front and back of the shirt which sets these T-shirts apart in quality and uniqueness. Ideal Children's gifts for sending overseas. All products at Alison Green Designs feature unique Australian wildlife designs. Textiles are hand cut and hand printed from top quality fabrics and designed to last. Alison Green Designs is a small business situated in the Hunter Valley north of Sydney. Alison has been hand printing her own designs onto textiles for over 30 years and is well known for her accurate rendition of Australian birdlife. She has a following of loyal customers who buy from her T-shirt and Homewares ranges for themselves and for overseas friends. Prices and products on her website cover the complete spectrum from 100% cotton hand made T-shirts to more expensive collectable Wall Pieces. Are you looking for some funny and great gifts for kids? if yes, then please visit Gifts2thedoor.com.au. We are offering great gifts ideas for kids. t-shirt printing Australia-Vibrant australian company based in sydney's south west. Specializing in custom t shirt printing Sydney, t-shirt printing Australia & bulk t-shirt printing.